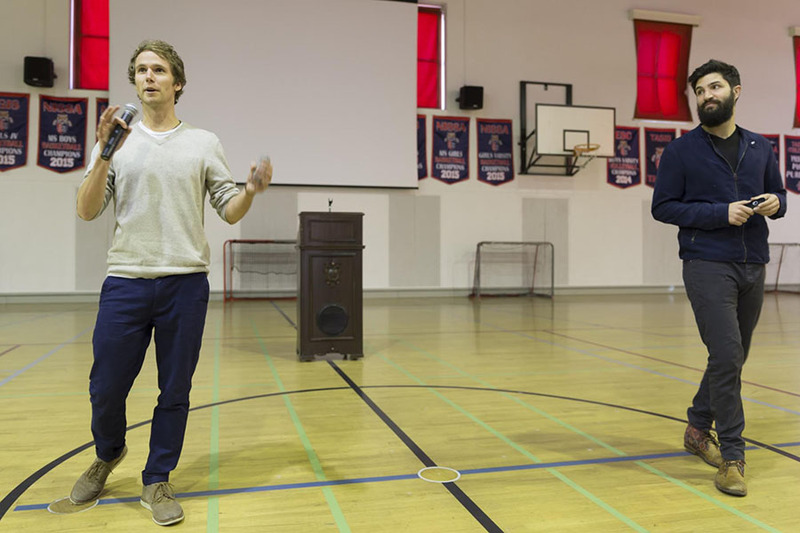 The American School in Switzerland (TASIS) was honored to welcome pioneering filmmakers Zach Ingrasci and Chris Temple to campus on Thursday, January 19. Their visit, which was co-sponsored by the School’s Global Service Program, marked the third installment of the 2016–2017 Senior Humanities Program. Ingrasci and Temple, who are best known for their award-winning documentaries Living on One Dollar and Salam Neighbor, gave an inspiring presentation to the entire High School at a special assembly on the morning of their visit, met with the Red Cross Refugee Service Learning Group in the early afternoon, led a heartwarming discussion with faculty and student leaders from the Global Service Program later in the afternoon, delivered a Senior Humanities Program (SHP) address in the Palmer Center at 19:00, and closed the day by speaking with interested students at a reception Casa Fleming. Ingrasci and Temple began their journey in 2010, when they and two university friends traveled to Guatemala with two cameras and spent their summer living on one dollar a day in a rural village. The intrepid group encountered intense hunger, parasites, and other obstacles but found strength in their Guatemalan neighbors and friends. After the short videos they released on YouTube in real time racked up more than 700,000 views, the film team was inspired to produce the feature-length documentary that would become Living on One Dollar. Upon graduating, they traveled around the United States in a renovated 1978 school bus for four months in an effort to share their film, which has since won Best Documentary at the Sonoma International Film Festival; received endorsements from Nobel Laureate Muhammad Yunus, USAID Administrator Rajiv Shah, and Hunger Games Director Gary Ross; and helped raise more than $650,000 for programs focusing on education, scholarships, and microfinance loans. In their presentation at the TASIS assembly, Ingrasci and Temple spoke about the whirlwind journey that began after they returned from Guatemala. In 2012 the group launched Living on One, a production and social impact studio that produces films and educational videos designed to raise awareness and inspire action around pressing global issues. They have since released Salam Neighbor, which chronicles the time Ingrasci and Temple spent living alongside displaced Syrian families in the Za’atari refugee camp in Jordan, and a number of short video series. The first filmmakers allowed to be registered and given a tent inside a refugee camp, Ingrasci and Temple shot more than 300 hours of footage over the course of a month as they sought to tell the stories of their refugee neighbors with both dignity and depth. During their Senior Humanities Program address, they spoke about the extraordinary challenge of crafting the footage into a single narrative, the power a story has to effect change, and the moment they understood that their work had contributed to action on a global stage. While Ingrasci and Temple continue to work on ambitious, socially conscious films, they also carve out time to travel to schools around the world and have developed a well-deserved reputation for connecting with students on a deeper level. Ingrasci and Temple were equally impressed with the students they met. "We may have learned more from TASIS students than they learned from us!” they said after the visit. “Their diversity of experiences makes them a unique resource to one another and to the world. We look forward to witnessing the change they create." Ingrasci and Temple were the third speakers welcomed to campus this year for the Senior Humanities Program, which seeks to draw from five defining elements of the TASIS identity–truth, beauty, goodness, international understanding, and humanitarian action–to provide seniors and postgraduates with a signature educational experience. The program’s committee selects five speakers each year who embody the pillars of the program. Journalist John Hooper visited on October 24 to open the 2016–2017 Senior Humanities Program, and humanitarian Heela Najibullah spoke on November 7. Author Steve Hahn (February 20) and Berkeley professor Jeffrey Reimer (March 13–15) will round out this year’s lineup. The TASIS Global Service Program was envisioned by Jan Opsahl ’68, the School’s first international student, and became a reality in 2013. It transforms lives by providing every High School student with a unique opportunity to connect across borders—whether geographic, economic, or social—through comprehensive experiences that build empathy and encourage personal responsibility. The pioneering program awakens students to humanitarian needs; inspires them to build enduring, mutually beneficial relationships; and leads them toward a life of active citizenship and committed service. Visit the TASIS SmugMug page to see a gallery of photos from Ingrasci and Temple’s visit.